Everybody wants to have a perfect holiday, but sometimes it’s way too stressful to find plane, bus or train tickets that would suit you and your family’s budget. Not to mention that it can be even harder if you are travelling with kids and can’t stop whenever it’s needed. That’s why many families decide to get a trailer and hit the road with it! 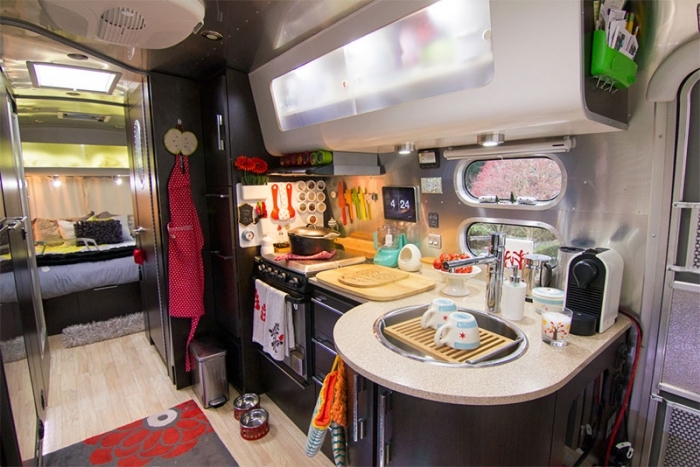 It can be like a miniature version of your home if you pay attention to your RV kitchen. Considering the fact that RV kitchens don’t give you much space, it’s of utmost importance for you to save as much space as you can. Bulky cabinets will take way too much space, not to mention that you and your family members may often bump into them while you are trying to make some breakfast. If you need some extra cabinets, put them on the existing ones. If the design doesn’t match, you can always breathe in a brand new look by painting them or using self-adhesive wallpapers. A sink is one of the most important things you must have in your RV kitchen and, believe it or not, you can also save some space thanks to it. Get a faucet with a high-goose neck design so you would be able to wash everything you need without a problem. Place a roll-up drying rack on the sink and you’ll get a perfect place for cooling food and even an extra countertop for cutting vegetables, meat or fruits. It’s very important that you check the material and recommended uses of the roll-up drying rack – better be safe than sorry. When buying the dishes for your trailer, you have to consider a few things. First of all, there is not much space in your RV kitchen for you to drag numerous pots. Therefore, think about buying an instant pot. It will come with many benefits – you will be able to prepare lunch faster than in the regular pots, plus, it won’t take up much of your storage. Second of all, don’t forget that you are still driving to your destination and that’s why there is no place for fine china dishes. Buy more durable and microwaveable dishes and you are ready to roll! Once you and your family reach your destination, it’s time to make some lunch and enjoy your holiday. In case you cooked a lunch on a stove while your partner was driving, all you have to do is to warm it up before serving. However, there is no need that your food should get cold once you already cooked it. After you finished with cooking, store your tasty meal inside a Dacor Renaissance warmer drawer and simply take it out while your family sets up the table. Bon appétit! Some people opt for keeping cutlery in a basket or a Mason jar, but if it’s not your cup of tea, then it’s time that you upgrade the drawers. Forget about a standard cutlery tray – you will easily avoid a mess if you get multi-tier cutlery trays and a few drawer dividers. They are easily cleaned and will save you from having spoons, forks and knives all messed up in your drawers. You can’t imagine eating without all those tasty spices, but your head starts to hurt just when you think how many of those little jars you have to bring with you? Don’t worry because you can easily get some storage space for all your spices in your RV kitchen and the best thing is that you can make it yourself! Instead of putting all those little jars on shelves, roll up your sleeves and make a magnetic spice rack! There are some dishes that you use every day for your family breakfast, lunch and dinner. It can be truly tiring to have to put them inside the cabinets every single time. That’s why you should consider having a few open shelves in your RV kitchen. Once you reach your destination and park the trailer, take out those dishes and place them on the shelves. This way, you will easily get the necessary plates – not to mention that your little ones won’t be able to reach and break them while you’re not looking. 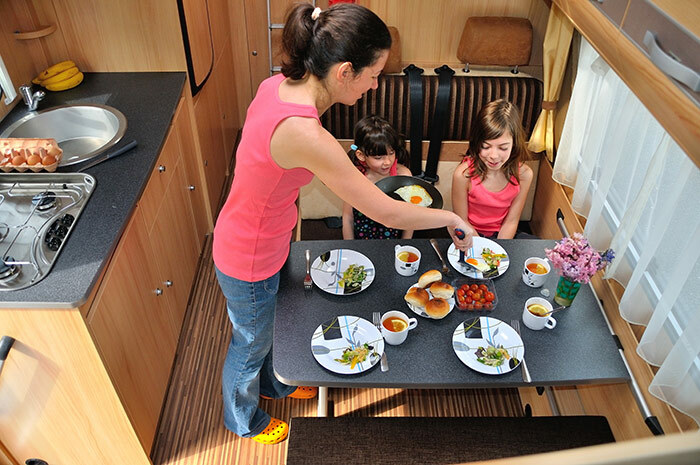 Remember; no matter how tiny your RV kitchen is, it will be just what you need if you carefully organize it in accordance with your family needs. 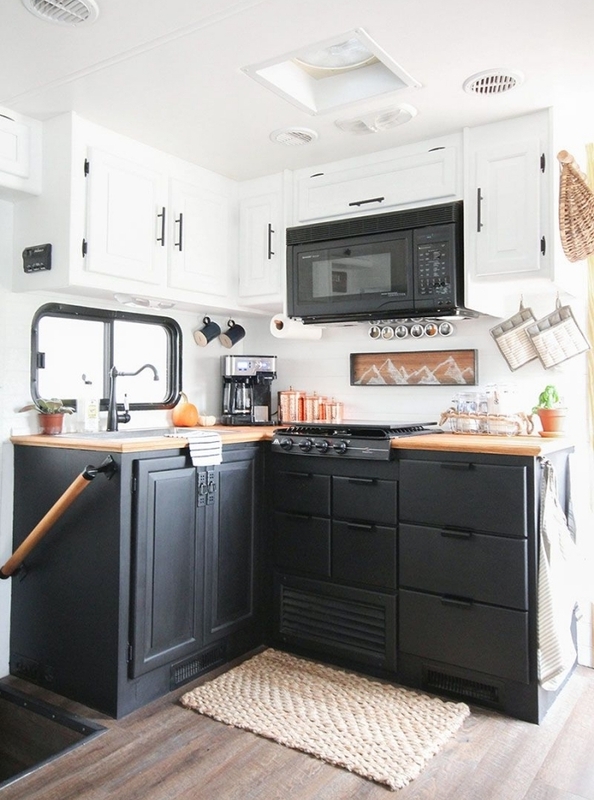 Freeing up the space with these smart tricks will enable you to move around your RV kitchen and make all those delicious meals without a fuss.